Since our inception in 2004, we’ve applied science, technology innovation and business expertise to develop a better way to protect comprehensive identity integrity. Combining years of industry experience, Tricerion’s management brings an unusual combination of insight and innovation to the challenge of online security. Defeating online identity thieves can never be about just doing things the way they’ve always been done. It calls for thinking outside the box, for creativity. It calls for passionate commitment to keeping users safe without sacrificing usability. Tricerion, now in our tenth year of protecting our customers’ online assets via our patent protected software, SafeLogin™. We provide Secure Mutual Authentication via Picture Passwords. Traditional passwords are no longer secure. With a Tricerion keypad users are never transmitting the actual password via the internet, this is decoded from the SafeLogin™ server by your system. Phishing is much easier to detect, as users choose their background and keypad sets and will instantly recognise when it’s the wrong keypad being shown to them. Since SafeLogin™ is an entirely software-based security solution, it can scale according to your precise needs without additional management or overhead. You can also achieve tremendous savings and management overhead reduction by removing the need for physical/SMS tokens to add multi-factor authentication. SafeLogin™ can handle it all for you, and it doesn’t require any additional hardware or software clients to work. SafeLogin™ is our patented mutual authentication software. SafeLogin™ offers protection against the most common forms of attack and also helps further by offering a real alternative to the high cost token authentication and biometric offerings, enabling your organisation to provide a user simple, low cost, high security solution. SafeLogin™ is the zero-footprint authentication solution that needs only what is stored in your users mind to complete its convenient and safe login environment. Picture passwords are easy to remember. Every time you login, you will see the same images, creating a familiar snapshot of your keypad – even the buttons that you don’t use in your password become important to the user, creating a login system with a high level of phishing protection. Users feel more secure that they will be able to gain access whenever they need. Picture based password are infinitely stronger than using username and password alone. Also unlike virtually ever other multi-factor authentication solution, SafeLogin™ never transmits your password over the internet. This offers unique protection from many of the most common security attacks as hacking methods such as phishing, pharming, dictionary attacks, trojans, spyware, keystroke loggers are all based on the idea of finding a text-based password. The visual appearance of SafeLogin™ can be completely customised with your own brand – we are one of the only vendors offering this feature. Upload any image you want, and create your own unique keypad. Each element can be precisely customised to fit your brand guidelines – for example the size of the keypad, and including the number, size, and position of each button. The keypad is also HTML friendly. You can add additional text HTML code or other scripts directly into the background area for added functionality. SafeLogin™ is not just a security solution; it’s also an advertising platform! Because the keypad is HTML friendly, you can easily insert customised code to create your own advertising platform or marketing campaign. Since keypads can be customised and deployed in unique groups, you can also run multiple ads or campaigns for different customers to support an overall marketing campaign. Deploy it for employees, external partners, or even your customers. This is one of the few multi-factor authentication solutions that can be deployed to anyone, anywhere, at any time, with the click of a button. Each group can have their own unique authentication requirements depending on your security needs – for example 4 picture passwords with one set of images for employees, and 6 picture passwords with a different set of images for customers. When you see the picture keypad for the first time, you intuitively understand how it works. 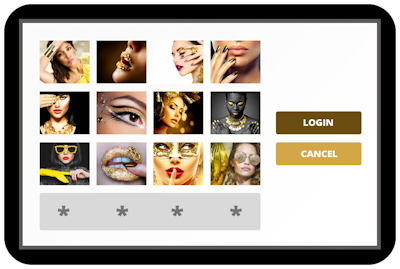 Simply select the series of pictures you want to use for your password, activate and that’s it! Picture-based passwords are also much easier to remember than complex alpha-numeric passwords. This has been proven through comprehensive scientific research. Talk to us about using SafeLogin™ today!